Tony's Heroine Collection takes a turn for the technological side with the beautiful Cyber Fairy Ai-On-Line ! Kotobukiya continues to bring you the forces of the First Order appearing in Star Wars: The Force Awakens with the Snowtrooper & Flametrooper 2 pack! Kotobukiya's ARTFX+ lineup of 1/10 scale statues based on characters from the Star Wars saga continues to expand with the release of Rogue One with the Shoretrooper! Fate/Grand Order - Saber/Altria Pendragon〔Alter〕Casual ver. The next servant to be summoned from the mobile game Fate/Grand Order is Saber/Altria Pendragon (Alter) in her casual clothes as seen in Shinjuku in Part 1.5 from the game! Kotobukiya's newest Bishoujo statue from Street Fighter is none other than Cammy with a different outfit as seen in Street Fighter Zero! 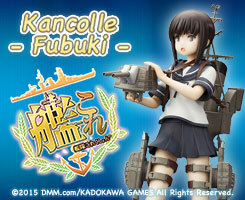 Kotobukiya brings Fubuki (the girl named after a Japanese Warship) to life, based on the popular online card game KanColle ! Kotobukiya ARTFX+ 1/10th scale statues returns to Marvel Comics statues based on Adi Granov's design, here is Black Panther! Marvel - Hawkeye "Avengers Now"
Kotobukiya's line of ARTFX+ statues based on Marvel Comics continues with the Hawkeye "Avengers Now!" statue! Kotobukiya's ARTFX+ lineup of beloved characters from the STAR WARS saga continues with Poe Dameron & BB-8 in a two pack set! Kotobukiya's lineup of characters based on the Star Wars movies continues with Rey and Finn from Star Wars:The Force Awakens! "Traitor!" Kotobukiya returns to The Force Awakens for a very special Stormtrooper: FN-2199! Kotobukiya presents the dark Force-wielder Kylo Ren from the latest Star Wars movie Episode VII: The Force Awakens ! 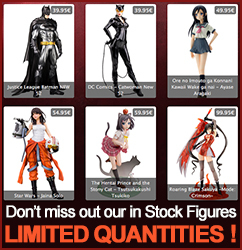 Kotobukiya's next ARTFX+ statue lineup is from none other than the Justice League movie! Kotobukiya's popular lineup of comic book and movie characters based on characters originating in DC Comics continues to expand to the TV series with James Gordon from Gotham! Next up in Kotobukiya's lineup of ARTFX+ statues based on Super Villains appearing in DC Comics is none other than Superman's opposite, Bizzaro! Kotobukiya bring's more villains from DC Comics to their ARTFX+ 1/10 scale statue lineup with Captain Cold! Kotobukiya presents the latest entry in their lineup of ARTFX+ statues based on characters from DC Comics with Superman's greatest foe: LEX LUTHOR! Kotobukiya continues the popular 1/10th scale lineup of ARTFX+ statues based on characters appearing in DC Comics with the modern take on Superman as seen in the "Rebirth" relaunch. Following Harley Quin and Poison Ivy in the 1/10th ARTFX+ scale, here comes Catwoman! Kotobukiya proudly presents the latest in Spartan technology with the Spartan Athlon Armor ARTFX+ Statue. Kotobukiya is proud to present MEGAMAN, also known as “Rockman”, Capcom’s world-renowned and beloved hero as an all-new plastic model kit ! Kotobukiya's Horror movie series lineup of characters re-interpreted into their signature Bishoujo style continues with a follow-up to Chucky: get ready for Tiffany!